Star Trek Into Darkness marks the twelfth instalment in the Star Trek franchise – which dates all the way back to 1966 – and plays as the direct follow-up to the 2009’s successful reboot, Star Trek. The film launches into action with a thrilling opening sequence which finds Capt. James T. Kirk (Pine) in deep trouble. In an attempt to save Spock (Quinto) and the natives of Planet Nibiru from a catastrophic volcano eruption, Kirk puts the entire Starfleet in danger by revealing the U.S.S Enterprise’s hideout and by interfering with Nibiru’s primitive civilisation – prime directives which should never be broken. Even though his intentions were moral, Kirk knows that he’s crossed the line. Facing demotion as an executive officer and with Spock reassigned to another ship, Kirk’s lofty ambitions look more and more unlikely. Soon, all is forgotten, however, when an act of terrorism shakes London. The man behind the attack – as the Starfleet soon learns – is John Harrison (Cumberbatch); an ex Starfleet agent gone rogue, who has now escaped to the Planet of Klingons. With Kirk and Spock reassigned to the U.S.S Enterprise once again, the crew – which includes ship Helmsman Hikaru Sulu (Cho), Chief Medical Officer Leonard ‘Bones’ McCoy (Urban), Chief Engineer Montgomery ‘Scotty’ Scott (Pegg) and Communication Officer Nyota Uhura (Saldana) – are sent on a dangerous mission to capture and eliminate the terrorist. However, their mission – as Captain Kirk and his team soon learn – is not at all what it seems and disturbing secrets soon bubble their way to the surface. Director J.J. Abrams – along with the team of returning writers, Roberto Orci, Alex Krutzman and Damon Lindelof – continues to breathe life into the beloved science-fiction series and his newest addition makes the four year wait for a sequel worth it. It’s nothing short of an edge-of-the-seat extravaganza with plenty of excitement to keep everyone – including the non-Trekkies – amused. Aside from the expected action-packed scenes, the writers also manage to find time for more character-oriented threads, which allow the audience to connect just a little bit more to these iconic characters. As far as the die-hard Trekkies are concerned, don’t despair; there are plenty of nods to the past and trips down the memory line with references to former characters, locations and weird alien species. Pine seems to be settling into the role of the infamous Captain Kirk pretty well; emotional and driven, Pine possesses the charisma to anchor such an epic. Meanwhile, the terribly talented Quinto is magnetic; his restrained and cold exterior provides plenty of laughs and, at the same time, plenty of stirring moments as we witness significant character growth. Pegg and Urban offer much of the comic-relief, while Saldana unfortunately fades into the background. Most significantly, however, Cumberbatch shows plenty of depth as what is slowly revealed to be a complex antagonist. 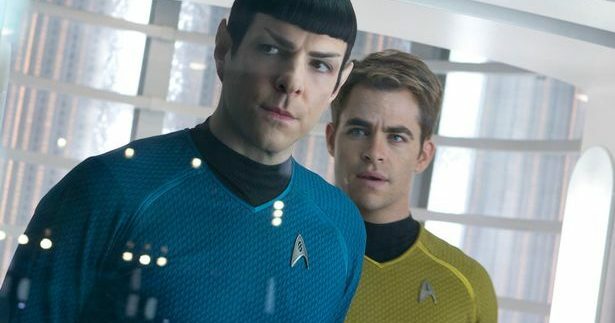 All in all, Star Trek Into Darkness offers guaranteesd entertainment. As an exhilarating and often moving addition to the franchise, JJ Abrams has proved that remakes, reboots and sequels can still be done well. Good job. Benicio Del Toro was an early frontrunner for the role of John Harrison, but eventually declined. Now that would have been something!